The National Archives and Records Administration (NARA) is an independent agency of the United States government charged with preserving and documenting government and historical records and with increasing public access to those documents, which comprise the National Archives. NARA is officially responsible for maintaining and publishing the legally authentic and authoritative copies of acts of Congress, presidential directives, and federal regulations. The NARA also transmits votes of the Electoral College to Congress. Originally, each branch and agency of the U.S. government was responsible for maintaining its own documents, which often resulted in the loss and destruction of records. Congress established the National Archives Establishment in 1934 to centralize federal record keeping, with the Archivist of the United States as chief administrator. The National Archives was incorporated with GSA in 1949; in 1985 it became an independent agency as NARA (National Archives and Records Administration). The first Archivist, R.D.W. Connor, began serving in 1934, when the National Archives was established by Congress. As a result of a first Hoover Commission recommendation, in 1949 the National Archives was placed within the newly formed General Services Administration (GSA). The Archivist served as a subordinate official to the GSA Administrator until the National Archives and Records Administration became an independent agency on April 1, 1985. 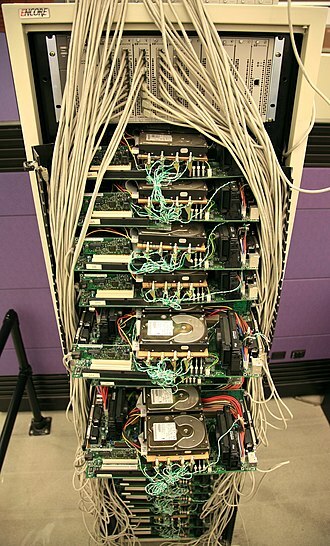 In 2002, Shawn Aubitz was arrested for stealing hundreds of documents and photographs from the National Archives; served 21 months in prison and paid $73,000 in restitution. ^ "What's an Archives". archives.gov. Retrieved January 26, 2011. ^ Act of June 19, 1934, Pub. L. No. 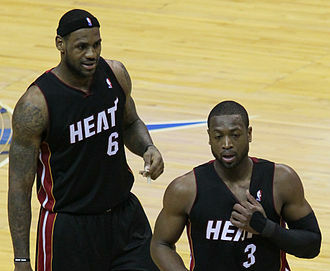 73-432, 48 Stat. 1122 (establishing the National Archives). ^ "National Archives and Google Launch Pilot Project to Digitize and Offer Historic Films Online" (Press release). archives.gov. 24 February 2006. 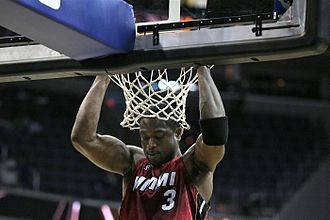 Retrieved March 31, 2011. ^ Ex-Archivist Sentenced for Document Theft, American Libraries, August 12, 2002. Amazon. com, called Amazon, is an American electronic commerce and cloud computing company that was founded on July 5,1994, by Jeff Bezos and is based in Seattle, Washington. It is the largest Internet-based retailer in the world by total sales, the company produces consumer electronics—notably, Kindle e-readers, Fire tablets, Fire TV, and Echo—and is the worlds largest provider of cloud infrastructure services. Amazon sells certain low-end products like USB cables under its in-house brand AmazonBasics. Amazon has separate retail websites for the United States, the United Kingdom, France, Germany, Spain, Australia, Japan, China and Mexico. Amazon offers international shipping to other countries for some of its products. In 2016, Dutch and Turkish language versions of the German Amazon website were launched. In 2015, Amazon surpassed Walmart as the most valuable retailer in the United States by market capitalization, in 1994, Bezos left his employment as vice-president of D. E. Shaw & Co. a Wall Street firm and moved to Seattle. 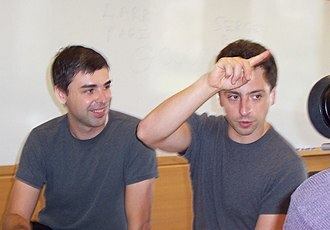 He began to work on a plan for what would eventually become Amazon. com. Bezos incorporated the company as Cadabra on July 5,1994, Bezos changed the name to Amazon a year after a lawyer misheard its original name as cadaver. In September 1994, Bezos purchased the URL Relentless. com and briefly considered naming his online store Relentless, the domain is still owned by Bezos and still redirects to the retailer. The company went online as Amazon. com in 1995, Bezos placed a premium on his head start in building a brand, telling a reporter, Theres nothing about our model that cant be copied over time. But you know, McDonalds got copied, and it still built a huge, multibillion-dollar company. A lot of it comes down to the brand name, brand names are more important online than they are in the physical world. Additionally, a beginning with A was preferential due to the probability it would occur at the top of any list that was alphabetized. Since June 19,2000, Amazons logotype has featured a curved arrow leading from A to Z, representing that the company carries every product from A to Z, with the arrow shaped like a smile. The Federal Government of the United States is the national government of the United States, a republic in North America, composed of 50 states, one district, Washington, D. C. and several territories. The federal government is composed of three branches, legislative and judicial, whose powers are vested by the U. S. Constitution in the Congress, the President, and the courts, including the Supreme Court. 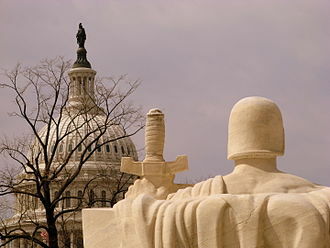 The powers and duties of these branches are defined by acts of Congress. The full name of the republic is United States of America, no other name appears in the Constitution, and this is the name that appears on money, in treaties, and in legal cases to which it is a party. 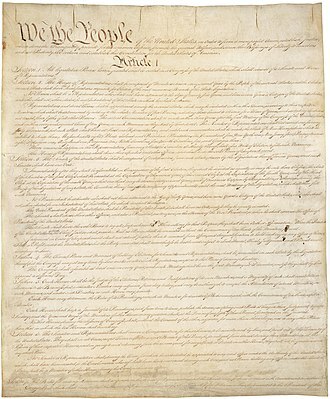 The terms Government of the United States of America or United States Government are often used in documents to represent the federal government as distinct from the states collectively. In casual conversation or writing, the term Federal Government is often used, the terms Federal and National in government agency or program names generally indicate affiliation with the federal government. Because the seat of government is in Washington, D. C, Washington is commonly used as a metonym for the federal government. 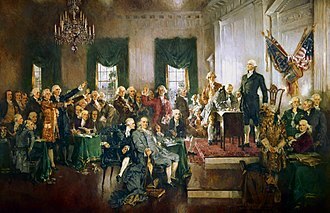 The outline of the government of the United States is laid out in the Constitution, the government was formed in 1789, making the United States one of the worlds first, if not the first, modern national constitutional republics. The United States government is based on the principles of federalism and republicanism, some make the case for expansive federal powers while others argue for a more limited role for the central government in relation to individuals, the states or other recognized entities. For example, while the legislative has the power to create law, the President nominates judges to the nations highest judiciary authority, but those nominees must be approved by Congress. The Supreme Court, in its turn, has the power to invalidate as unconstitutional any law passed by the Congress and these and other examples are examined in more detail in the text below. 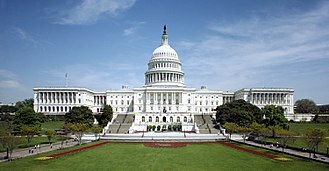 The United States Congress is the branch of the federal government. Charles Merrill Mount was an American artist. 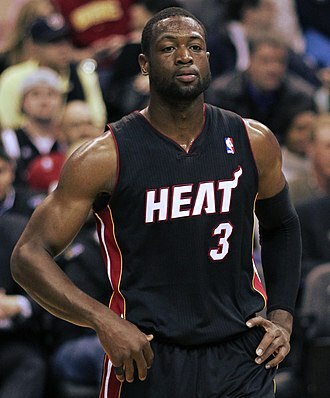 Born in Brooklyn, New York in 1928 as Sherman Merrill Suchow, he changed his name. He won a Guggenheim Fellowship in 1956 and travelled to Europe where he worked in Italy, Britain and he returned to the United States in 1969, and worked in New York and Washington, D. C. He specialized in portraits and produced landscapes and streetscapes in oil and he was interested in art history and published biographies of John Singer Sargent, Gilbert Stuart and Claude Monet. His career and personal life were marred by untreated bipolar disorder and he died in 1995 in Washington, D. C. He is survived by five children from two marriages, the Irish career of Gilbert Stewart. Bulletin of the Irish Georgian Society, Vol. VI.1964, carolus-Duran and the Development of Sargent, The ART Quarterly, Number 4. November 24,1873, The Precise Moment of Impressionism, Claude Monets The Bridge at Argenteuil at the National Galley of Art in Washington, Records of the Columbia Historical Society, Vol. 71-2, p. 508-547. The United States Congress is the bicameral legislature of the federal government of the United States consisting of two chambers, the Senate and the House of Representatives. The Congress meets in the Capitol in Washington, D. C, both senators and representatives are chosen through direct election, though vacancies in the Senate may be filled by a gubernatorial appointment. Members are usually affiliated to the Republican Party or to the Democratic Party, Congress has 535 voting members,435 Representatives and 100 Senators. The House of Representatives has six non-voting members in addition to its 435 voting members and these members can, sit on congressional committees and introduce legislation. Puerto Rico, American Samoa, the Northern Mariana Islands, the members of the House of Representatives serve two-year terms representing the people of a single constituency, known as a district. Congressional districts are apportioned to states by using the United States Census results. Each state, regardless of population or size, has two senators, there are 100 senators representing the 50 states. Each senator is elected at-large in their state for a term, with terms staggered. 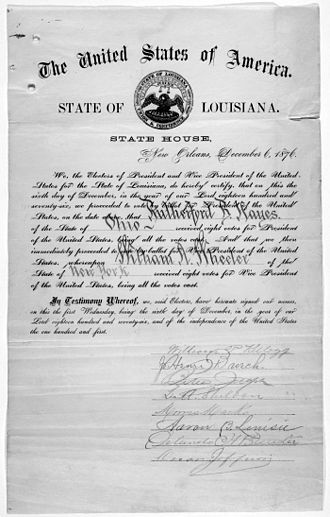 The House and Senate are equal partners in the legislative process—legislation cannot be enacted without the consent of both chambers, the Constitution grants each chamber some unique powers. The Senate ratifies treaties and approves presidential appointments while the House initiates revenue-raising bills, the House initiates impeachment cases, while the Senate decides impeachment cases. A two-thirds vote of the Senate is required before a person can be forcibly removed from office. The term Congress can refer to a meeting of the legislature. A Congress covers two years, the current one, the 115th Congress, began on January 3,2017, the Congress starts and ends on the third day of January of every odd-numbered year. Members of the Senate are referred to as senators, members of the House of Representatives are referred to as representatives, congressmen, or congresswomen. One analyst argues that it is not a solely reactive institution but has played a role in shaping government policy and is extraordinarily sensitive to public pressure. Constitution Avenue is a major east-west street in the northwest and northeast quadrants of the city of Washington, D. C. in the United States. It was originally known as B Street, and its section was greatly lengthened and widened between 1925 and 1933. It received its current name on February 26,1931, Constitution Avenues western half defines the northern border of the National Mall and extends from the United States Capitol to the Theodore Roosevelt Bridge. Its eastern half runs through the neighborhoods of Capitol Hill and Kingman Park before it terminates at Robert F. Kennedy Memorial Stadium, a large number of federal departmental headquarters and museums line Constitution Avenues western segment. 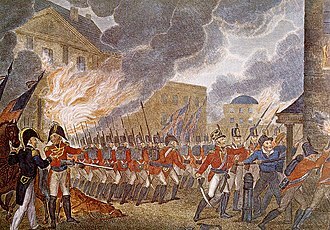 In Pierre Charles LEnfants original plan for the city in 1791, B Street NW began at 6th Street NW and its eastern segment, which was unimpeded by any water obstacles, ran straight to the Eastern Branch river. Along its entire length, B Street was 60 feet wide, LEnfant proposed turning Tiber Creek into a canal. His plan included cutting a new canal south across the side of the United States Capitol grounds. The Washington Canal Company was incorporated in 1802, and after several false starts substantial work began in 1810, the Washington City Canal began operation in 1815. The canal suffered from problems and economic competition almost immediately. Traffic on the canal was adversely affected by forces, which the builders had not accounted for. At low tide, portions of the canal were almost dry, after the Baltimore and Ohio Railroad built Washington Branch into the city in 1835, competition from railroads left the canal economically unviable. Although the Washington City Canal remained in use after the coming of the railroad, by 1855 it had filled with silt and it remained in this condition throughout the 1860s. In 1871, Congress abolished the elected mayor and bicameral legislature of the District of Columbia, territorial government only lasted until 1874, but during this period the D. C. Board of Public Works enclosed the canal and turned it into a sewer, B Street NW from 15th Street to Virginia Avenue NW was constructed on top of it. Classified information is material that a government body claims is sensitive information that requires protection of confidentiality, integrity, or availability. Access is restricted by law or regulation to particular groups of people, a formal security clearance is often required to handle classified documents or access classified data. The clearance process requires a satisfactory background investigation. Documents and other assets are typically marked with one of several levels of sensitivity—e. g. Restricted, confidential and top secret and this often includes security clearances for personnel handling the information. Although classified information refers to the formal categorization and marking of material by level of sensitivity, a distinction is often made between formal security classification and privacy markings such as commercial in confidence. Classifications can be used with additional keywords that give more detailed instructions on how data should be used or protected, with the passage of time much classified information becomes much less sensitive, and may be declassified and made public. Sometimes documents are released with information still considered confidential obscured, as in the example at right, the purpose of classification is to protect information. Higher classifications protect information that might endanger national security, Classification formalises what constitutes a state secret and accords different levels of protection based on the expected damage the information might cause in the wrong hands. However, classified information is leaked to reporters by officials for political purposes. Several U. S. presidents have leaked information to get their point across to the public. Although the classification systems vary from country to country, most have levels corresponding to the following British definitions Top Secret is the highest level of classified information. Information is further compartmented so that specific access using a word after top secret is a legal way to hide collective. Such material would cause exceptionally grave damage to security if made publicly available. The Federal Register, abbreviated FR or sometimes Fed. Reg. is the journal of the federal government of the United States that contains government agency rules, proposed rules. It is published daily, except on federal holidays, the Federal Register is compiled by the Office of the Federal Register and is printed by the Government Publishing Office. There are no restrictions on the Federal Register, as a work of the U. S. government. In essence, the Federal Register is a way for the government to announce changes to government requirements, the notice and comment process, as outlined in the Administrative Procedure Act, gives the people a chance to participate in agency rulemaking. 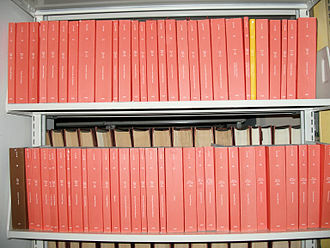 Publication of documents in the Federal Register constitutes constructive notice, the Federal Register is the main source for the U. S. Both proposed and final rules are published in the Federal Register, a Notice of Proposed Rulemaking typically requests public comment on a proposed rule, and provides notice of any public meetings where a proposed rule will be discussed. The public comments are considered by the government agency. The United States Government Manual is published as an edition of the Federal Register. Its focus is on programs and activities, to purchase current or back print copies of the Federal Register, one may contact the U. S. Government Publishing Office. In each issue of the Federal Register, there is a subscription page, currently, a years subscription rate within the U. S. is US$929. Each individual issue may be priced from $11 to $33 depending on its pages, virtually every law library associated with an American Bar Association–accredited law school will have a set, as will federal depository libraries. The Federal Register has been online since 1994. Federal depository libraries within the U. S. receive copies of the text, outside the U. S. some major libraries may carry the Federal Register. To help federal agencies manage their dockets, the Federal Docket Management System was launched in 2005 and is the side of regulations. gov. In April 2009, Citation Technologies created a free, searchable website for Federal Register articles dating from 1996 to the present. The term public domain has two senses of meaning. Anything published is out in the domain in the sense that it is available to the public. Once published and information in books is in the public domain, in the sense of intellectual property, works in the public domain are those whose exclusive intellectual property rights have expired, have been forfeited, or are inapplicable. 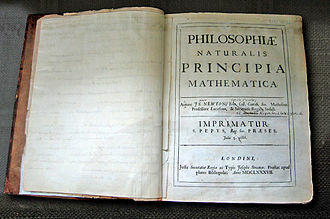 Examples for works not covered by copyright which are therefore in the domain, are the formulae of Newtonian physics, cooking recipes. Examples for works actively dedicated into public domain by their authors are reference implementations of algorithms, NIHs ImageJ. The term is not normally applied to situations where the creator of a work retains residual rights, as rights are country-based and vary, a work may be subject to rights in one country and be in the public domain in another. Some rights depend on registrations on a basis, and the absence of registration in a particular country, if required. 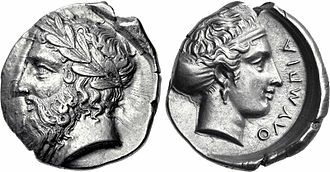 Although the term public domain did not come into use until the mid-18th century, the Romans had a large proprietary rights system where they defined many things that cannot be privately owned as res nullius, res communes, res publicae and res universitatis. 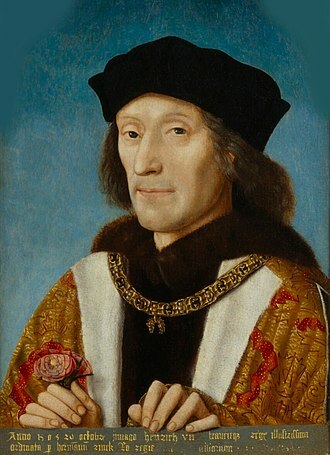 The term res nullius was defined as not yet appropriated. The term res communes was defined as things that could be enjoyed by mankind, such as air, sunlight. The term res publicae referred to things that were shared by all citizens, when the first early copyright law was first established in Britain with the Statute of Anne in 1710, public domain did not appear. However, similar concepts were developed by British and French jurists in the eighteenth century, instead of public domain they used terms such as publici juris or propriété publique to describe works that were not covered by copyright law. The phrase fall in the domain can be traced to mid-nineteenth century France to describe the end of copyright term. In this historical context Paul Torremans describes copyright as a coral reef of private right jutting up from the ocean of the public domain. Because copyright law is different from country to country, Pamela Samuelson has described the public domain as being different sizes at different times in different countries. The General Services Administration is an independent agency of the United States government, established in 1949 to help manage and support the basic functioning of federal agencies. GSA employs about 12,000 federal workers and has an operating budget of roughly $26.3 billion. GSA oversees $66 billion of procurement annually and it contributes to the management of about $500 billion in U. S. federal property, divided chiefly among 8,300 owned and leased buildings and a 210,000 vehicle motor pool. GSAs business lines include the Federal Acquisition Service, the Public Buildings Service, the GSA is member of the Procurement G6, an informal group leading the use of framework agreements and e-procurement instruments in public procurement. In 1947 President Harry Truman asked former President Herbert Hoover to lead what became known as the Hoover Commission to make recommendations to reorganize the operations of the federal government, one of the recommendations of the commission was the establishment of an Office of the General Services. This proposed office would combine the responsibilities of the following organizations, General Jess Larson, Administrator of the War Assets Administration, was named GSAs first Administrator. The first job awaiting Administrator Larson and the newly formed GSA was a renovation of the White House. The structure had fallen into such a state of disrepair by 1949 that one inspector of the time said the structure was standing “purely from habit. Everything, except the four walls without a roof, was stripped down. GSA completed the renovation in 1952, GSA headquarters, located at Eighteenth and F Streets, NW, was U. S. General Services Administration Building listed on the National Register of Historic Places in 1986 as Interior Department Offices, in 1960, GSA created the Federal Telecommunications System, a government-wide intercity telephone system. 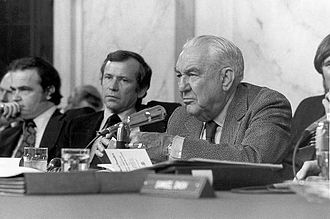 In 1970, the Nixon administration created the Consumer Product Information Coordinating Center, the Federal Buildings Fund was initiated in 1974, which allowed the GSA to issue rent bills to federal agencies. In 1972, the GSA established the Automated Data and Telecommunications Service, in 1973, the GSA created the Office of Federal Management Policy. GSA’s Office of Acquisition Policy centralized procurement policy in 1978, in 1984, GSA introduced the federal government to the use of charge cards, known as the GMA SmartPay system. The National Archives and Records Administration was spun off into an independent agency in 1985, the same year, the GSA began to provide governmentwide policy oversight and guidance for federal real property management as a result of an Executive Order signed by President Ronald Reagan. In 2003, the Federal Protective Service was moved to the Department of Homeland Security, in 2005, GSA reorganized to merge the Federal Supply Service and Federal Technology Service business lines into the Federal Acquisition Service. On April 3,2009, President Barack Obama nominated Martha N. Johnson to serve as the GSA Administrator, after a 9-month delay, the United States Senate confirmed her nomination on February 4,2010. 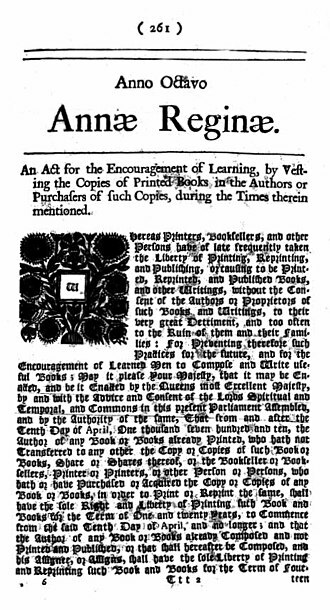 The Statute of Anne (the Copyright Act 1709) came into force in 1710. The Pirate Publisher—An International Burlesque that has the Longest Run on Record, from Puck, 1886, satirizes the then-existing situation where a publisher could profit by simply stealing newly published works from one country, and publishing them in another, and vice versa. A copyright certificate for proof of the Fermat's Last Theorem, issued by the State Department of Intellectual Property of Ukraine. The width of Constitution Avenue varied along its length between 1926 and 1933, as shown by the shift in sidewalks at its junction with Henry Bacon Drive NW. The original western terminus of Constitution Avenue NW, on the shores of the Potomac River. The avenue's connection to this terminus was severed in the mid-1950s. The eastern junction of Pennsylvania and Constitution Avenues NW. Traffic proceeding east on Constitution Avenue must veer sharply northward to access the street (seen going uphill through Senate Park in the distance). Constitution Avenue NW runs vertically through the left-center of this image, forming the north boundary of the National Mall and the south edge of Federal Triangle (the structures with red roofs). Smithsonian Institution Building ("The Castle") in 2007. Looking east from the top of the Washington Monument towards the United States Capitol in the summer of 1901. The Mall exhibited the Victorian-era landscape of winding paths and random plantings that Andrew Jackson Downing designed in the 1850s. 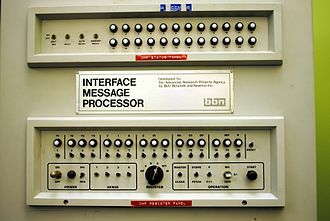 Front panel of the late-1960s-era ARPANET Interface Message Processor. IMP log for the first message sent over the Internet, using ARPANET. The heavy usage of smartphones among young people relates to the significant percentage of social media users who are from this demographic. Secretary of Defense William S. Cohen (center and pointing hand) gives the opening remarks at a Pentagon briefing for President Bill Clinton and Vice President Al Gore on February 17, 1998. Clinton was in the Pentagon to meet with the Joint Chiefs of Staff and his national security team for a Gulf region update. Berger is seated to Cohen's left. Sandy Berger with President Clinton and Secretary of State Madeleine Albright. 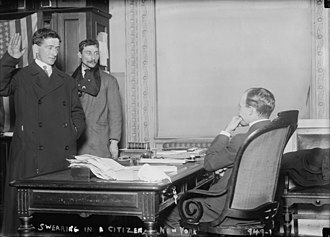 The National Archives building in Washington, D.C..
A man taking the required citizenship oath of allegiance in front of U.S. government officials in New York City (1910). 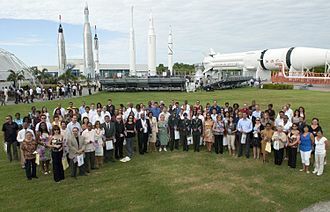 New citizens at a naturalization ceremony at Kennedy Space Center in Florida (2010).